My hound dog Valentino takes time to smell the flowers -- no matter the days of the week, no matter the weather. On this particular dog walking day we were drenched in a cool Spring rain. The bright red tulips reached high for the sun but found none. While the flowers stayed closed up pretty tight, my dog and I chose to continue our walk through the neighborhood -- creating a bit o' sunshine of our own with a tidbit of help from nature. 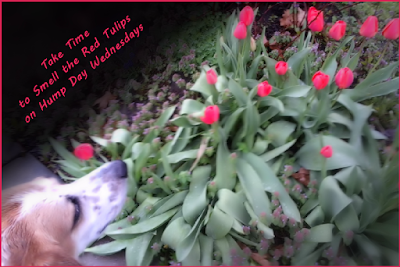 You are welcome to add a text message of your own to customize the Take Time to Smell the Red Tulips Postcard for your recipients! What would your personalized message on the red tulip postcard be? Always multi-tasking, we've another purpose to this blog post and that is to link up with BlogPaws for Wordless Wednesday. 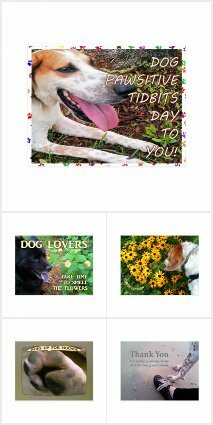 Come join the pet lovers community today!